We spent one night at Highline Lake State Park outside of Grand Junction. It was a nice enough place and had laundry as well as showers. 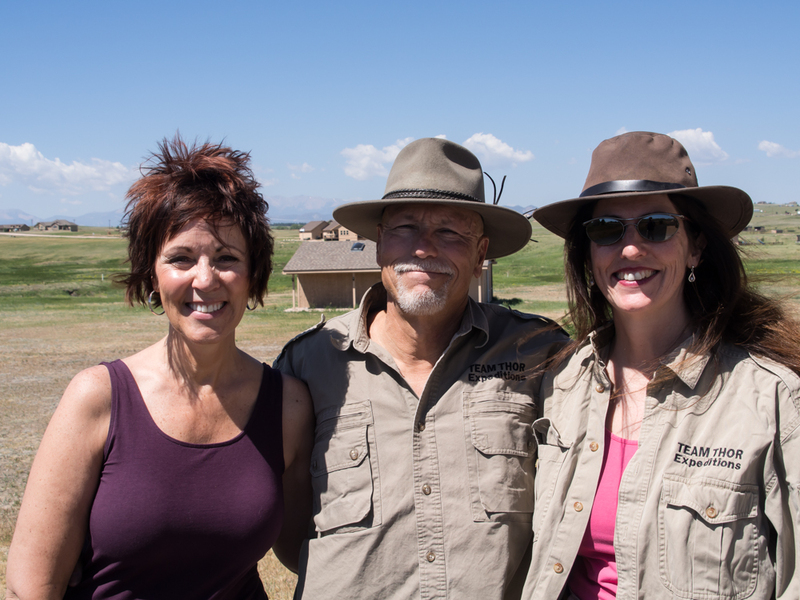 Next morning we broke camp and headed into Grand Junction for a stop at Cabela's. We were hoping that they would have ammunition, but were dismayed to discover that was not the case. Most of the handgun ammo was sold out (as it is at most stores). It seems that Mr. Obama has been good for ammunition sales. Once we completed lunch and a fuel stop, we headed east over the Rocky Mountains. 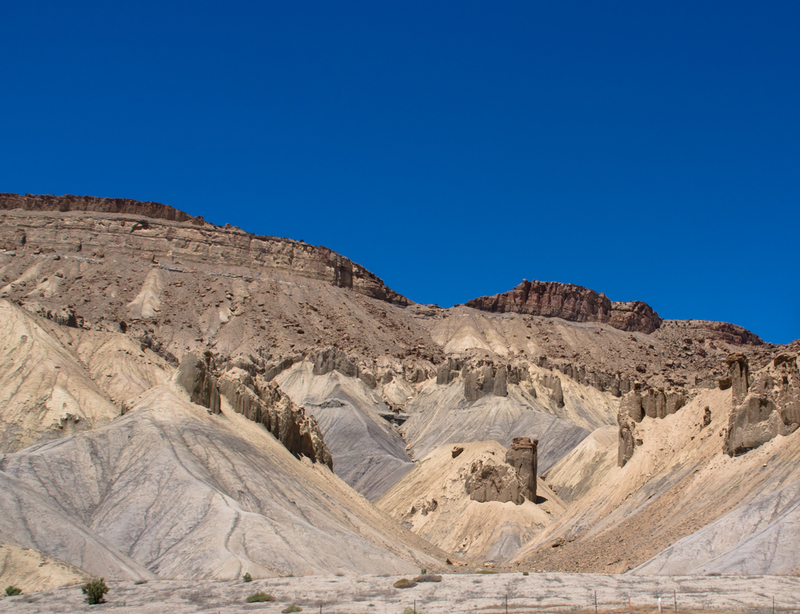 Just outside of Grand Junction we passed the Book Cliffs. There were many hoodoos on the cliff faces. 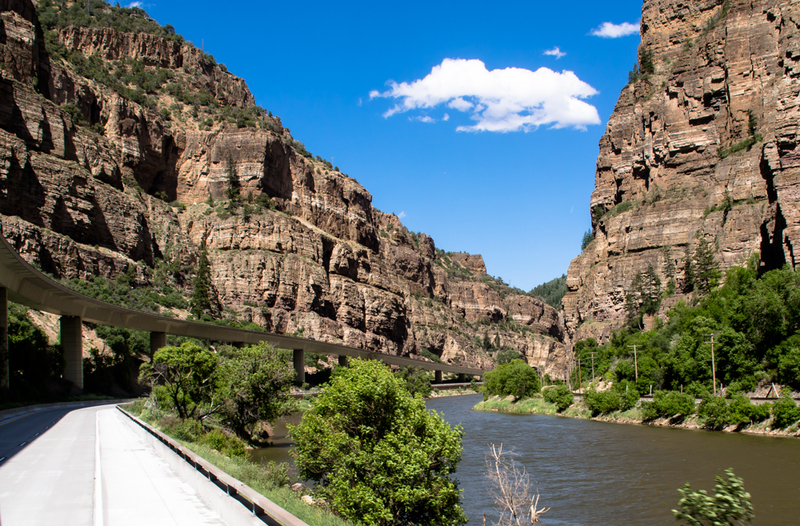 East of Grand Junction is Glenwood Springs and an awesome canyon that is shared by interstate-70 and the BNSF railroad main line. 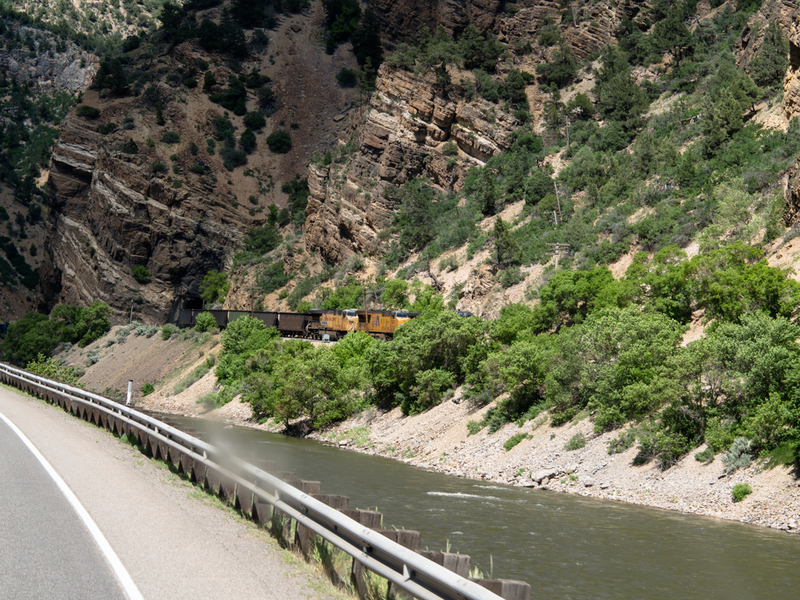 Above, we encountered an oncoming train emerging from a tunnel. 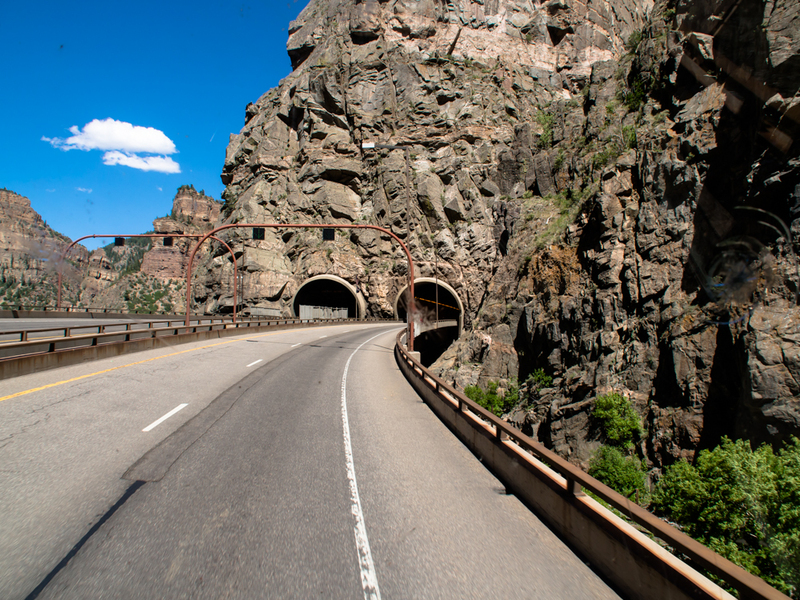 There were many sets of tunnels on the interstate within Glenwood Canyon. At several points within the canyon one of the paths of the interstate had to be stacked to fit within the available space. 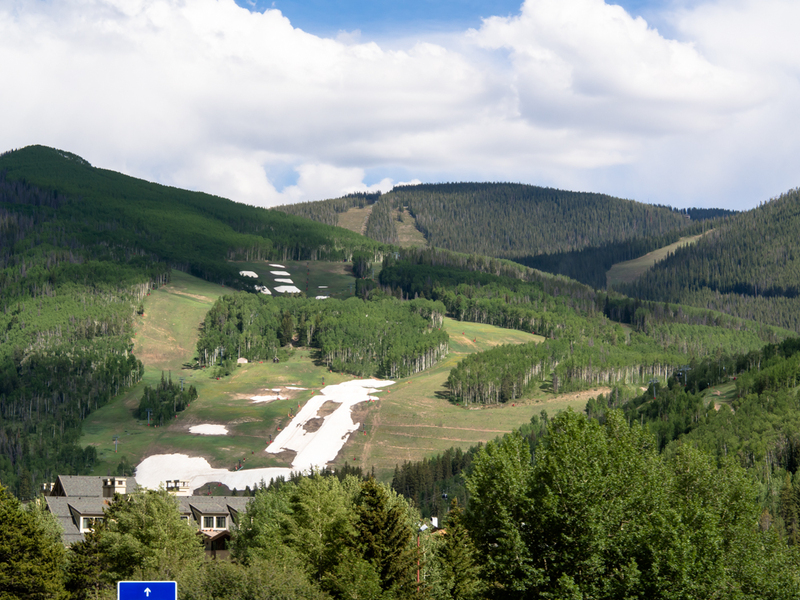 We passed Vail, CO and there was still a small amount of packed snow at the bottom of one of the runs. Thor struggled with Vail Pass. The combination of steep grades and high altitude made for slow going. 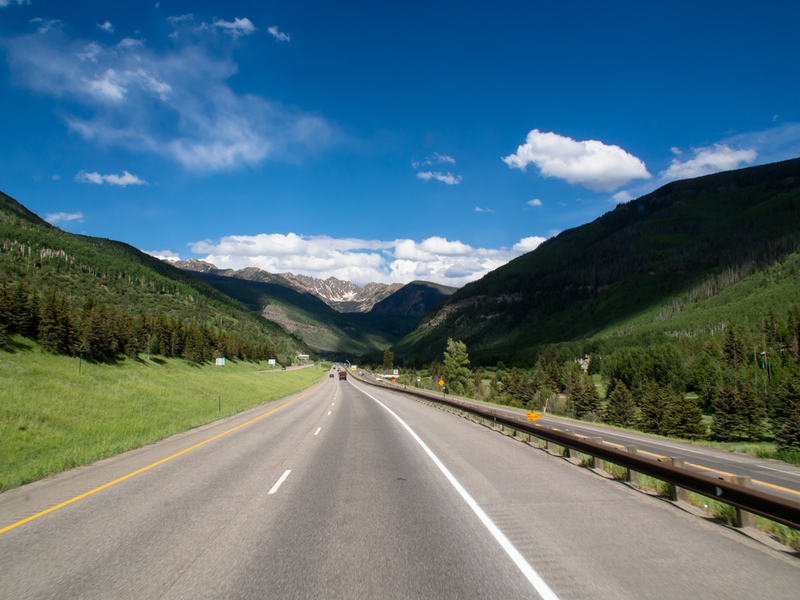 I-70 passes over the continental divide at Loveland Pass. In the old days, the final grade was steep, slow and dangerous in the winter. At 12,500 feet, it was one of the highest commonly-traveled auto routes. In the winter, it was a white-knuckle ride. 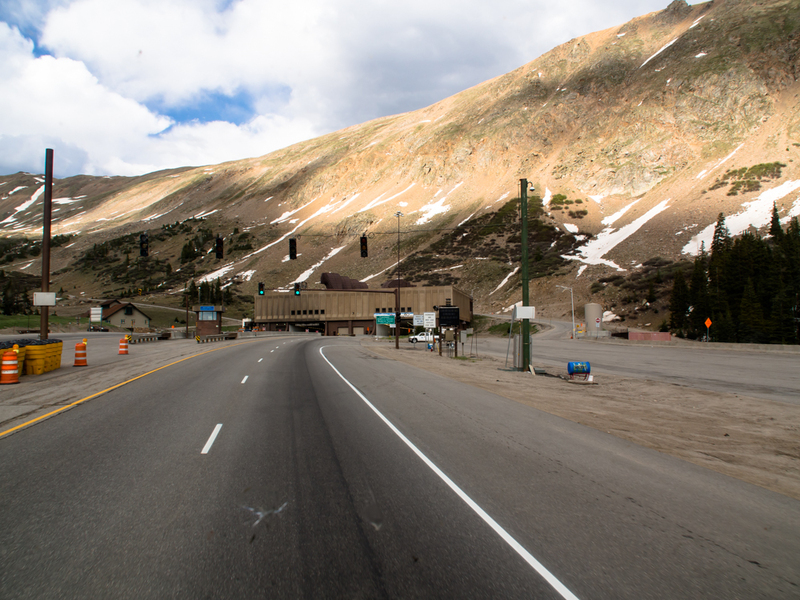 Now, the pass has been circumvented by Eisenhower Tunnel. The entrance to the tunnel is a tad over 11,000 feet, so it is still high in an absolute sense. We found a place to stay in Golden, CO and we spotted this biker with his girlfriend on the back. We called her Biker Barbie. 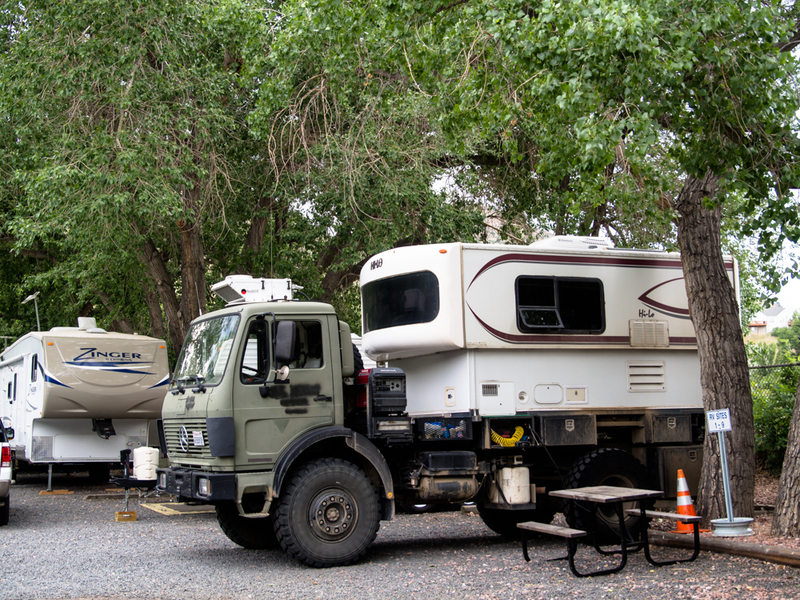 We were lucky enough to get a spot at the RV park on Clear Creek. The park was owned by the City of Golden and was small but clean and well run. 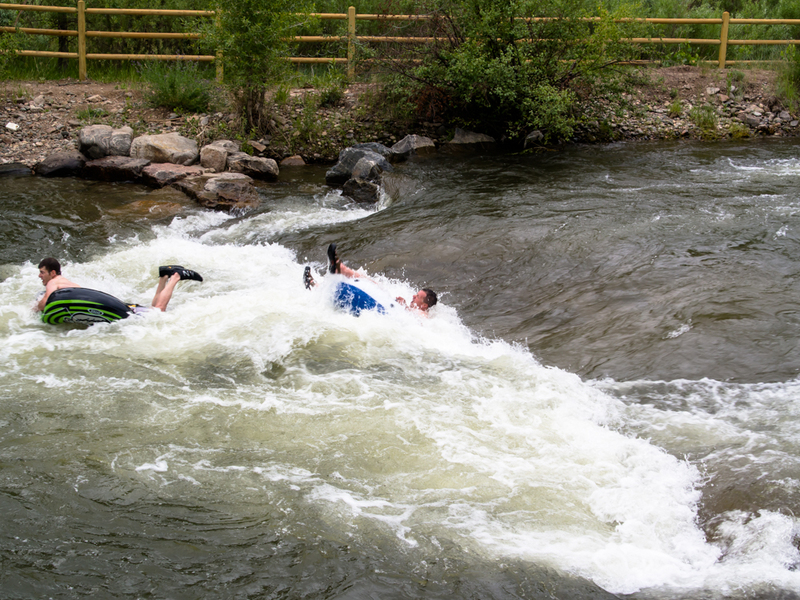 The camp was part of a whitewater park run by the city. 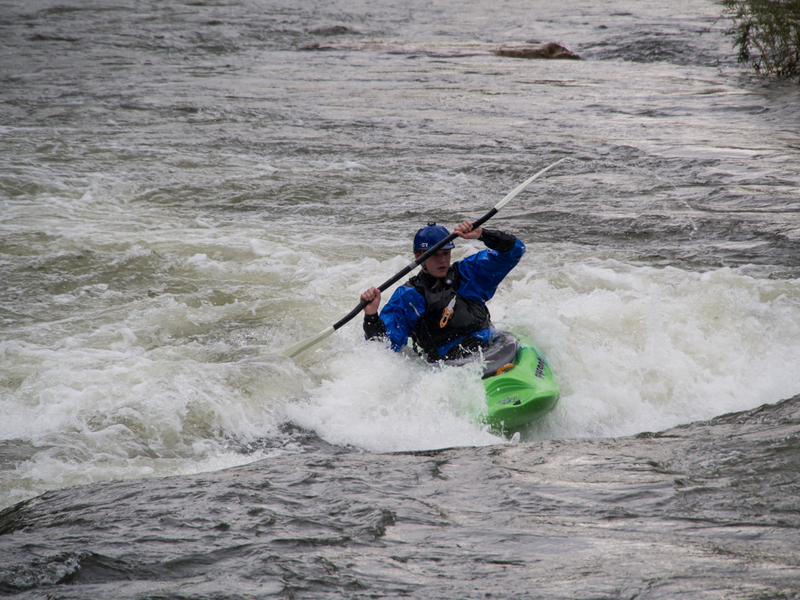 There were plenty of kayakers on the water. 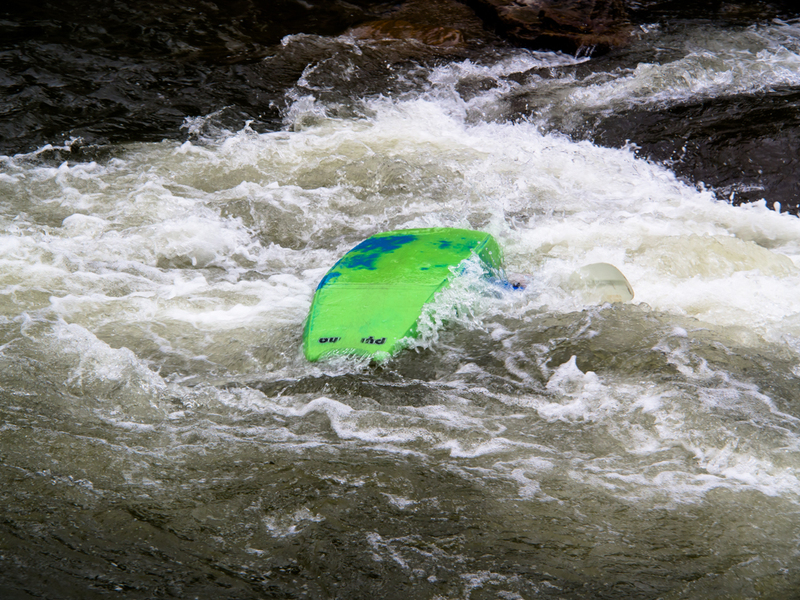 There were some tubers on the creek and they did not fare well in the rapids. The rear fellow was dumped shortly after this photo was taken. 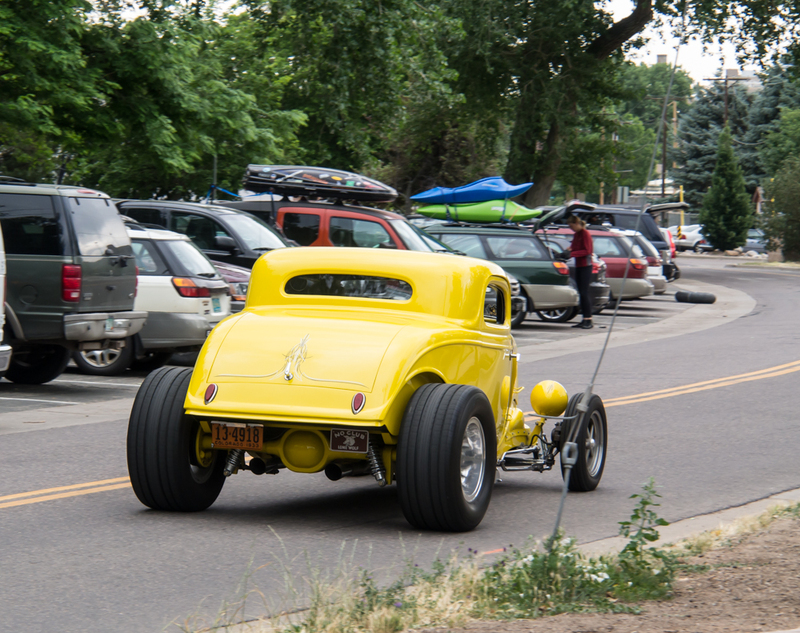 As we were watching the whitewater action, this nice rig came by, but I was not fast enough to get a shot of the front of the car. When I turned around, this fellow had rolled in his kayak. 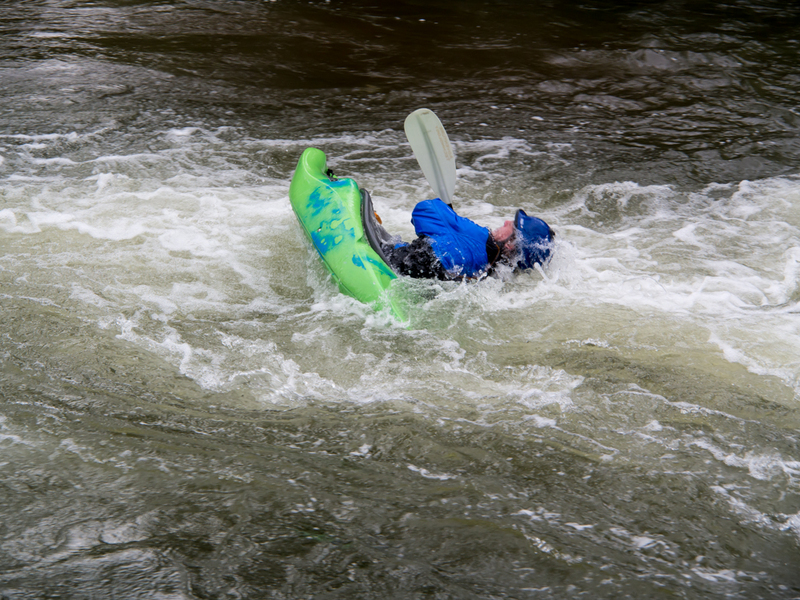 The fellow recovered using a technique called "the eskimo roll". We walked into old-town Golden and had a nice dinner. Next morning it was clear and calm and there a number of hang gliders and paragliders enjoying the calm air. 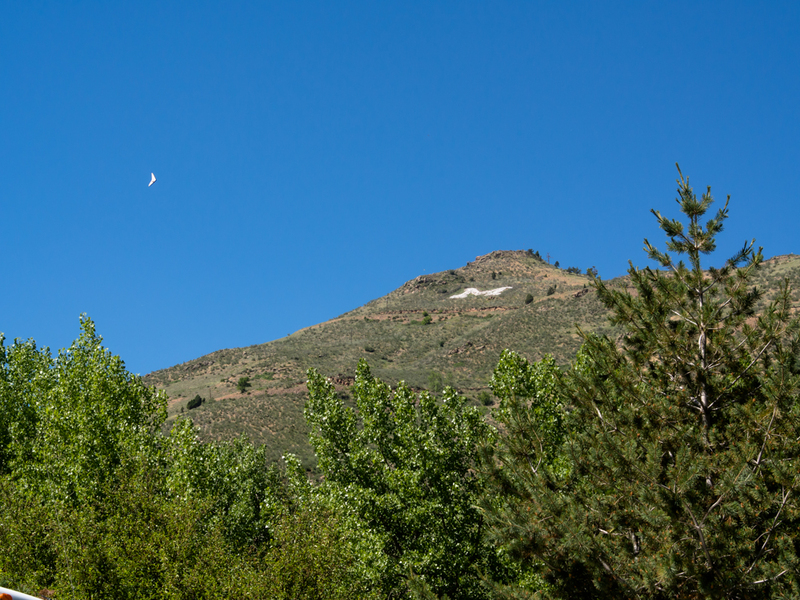 The "M" on the mountain is for Mines, as in Colorado School of Mines where I went to school in my early college days. 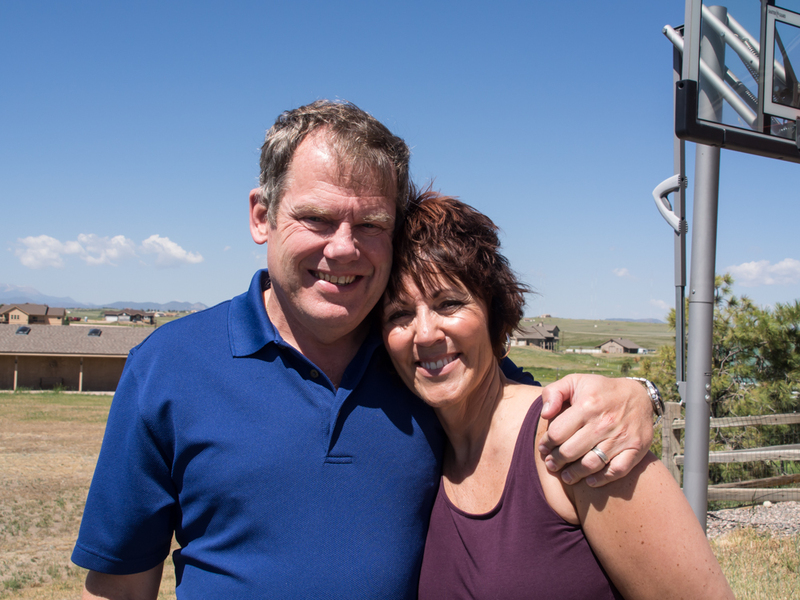 We spent the night with Peter and Becky outside of Colorado Springs. She is my niece. We had a great visit with Becky and Peter and it shows in the smiles. 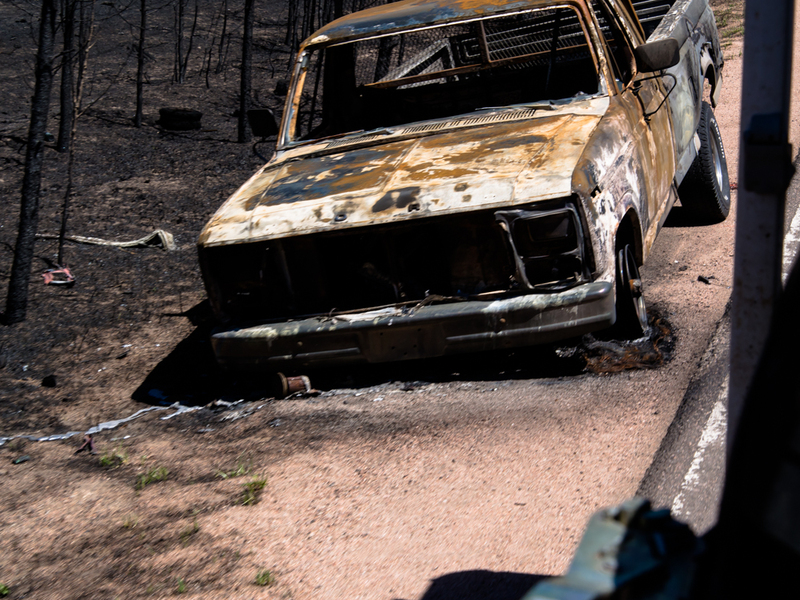 The Colorado Springs area had just suffered the so-called "Black Forest" fire. 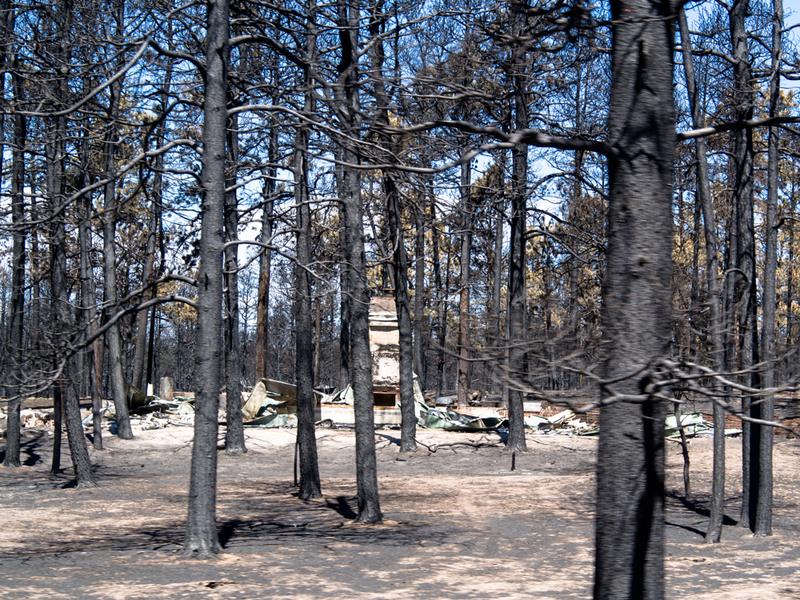 The fire burned hundreds of homes in the area and Becky and Peter were force-evacuated during the height of the fire. They suffered some angst, inconvenience and spoiled food. The folks above lost everything. This vehicle did not make it out of the fire zone and was burned. One of the homes we passed had a woman sitting on a pile of burned rubble wearing a face mask. She had the "thousand yard stare" and it was clear that it was the remains of her home she was sitting on. I did not get a photo of her because I was unprepared. 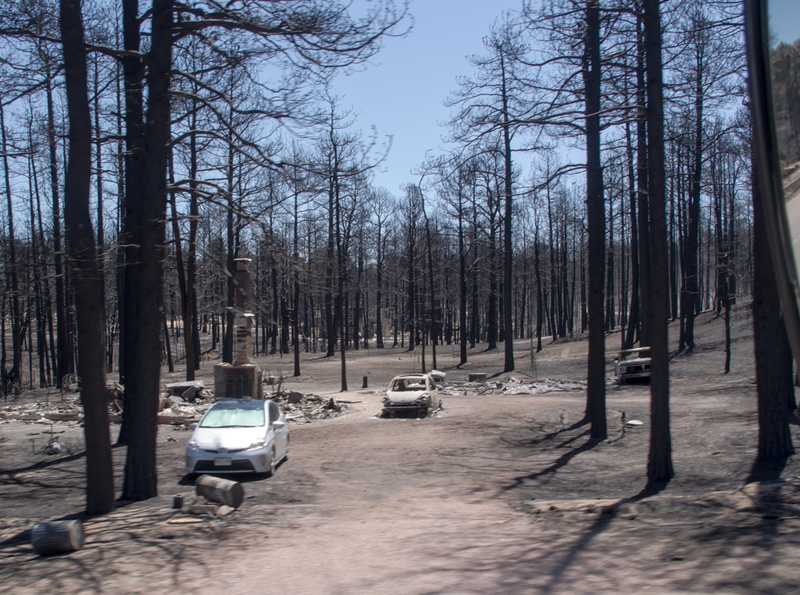 And, I have to admit that even though we were just driving through this area on our way to the highway, it felt ghoulish to even look at the aftermath. Only the foundation and chimney of this home remain. 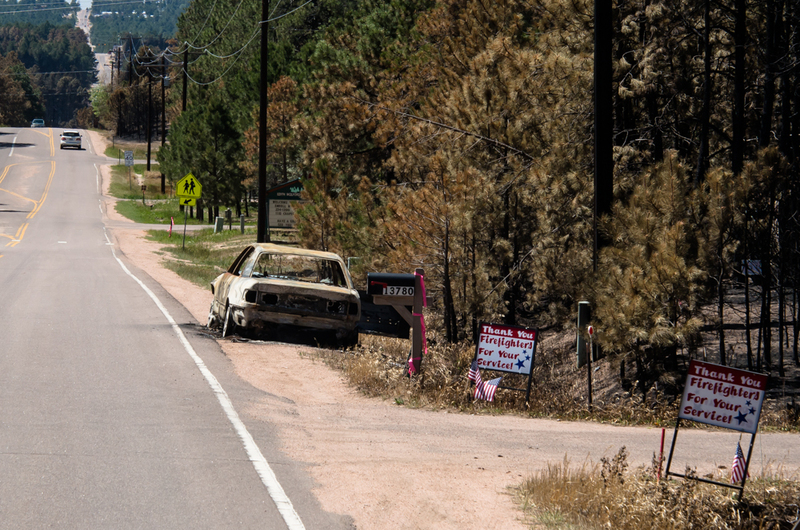 While the burned car is obvious, the signs at the side of the road tell the local sentiment. We saw many of these signs, most were hand done using spray paint on white sheets. The fire did a clean sweep across many of the neighborhoods in this area. 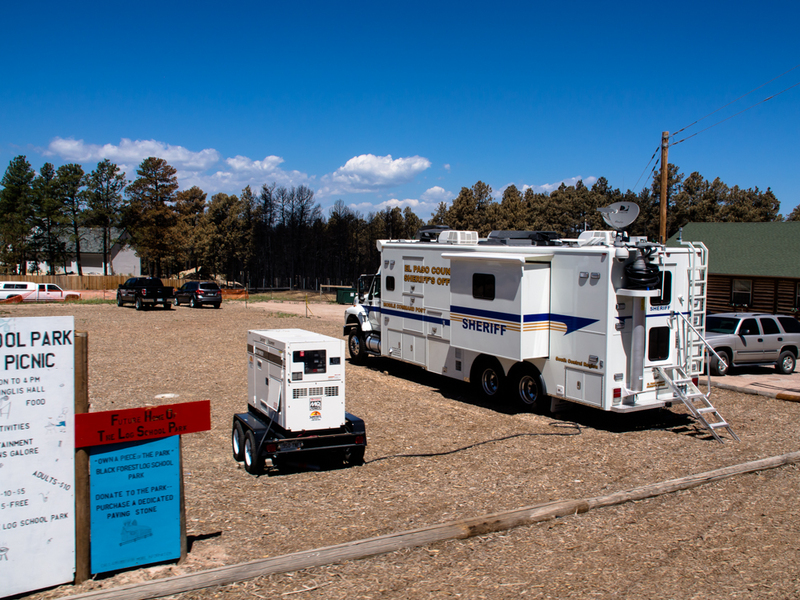 The local sheriff had a command center at the boundary of the burned zone. Our travel to La Junta was thankfully uneventful. 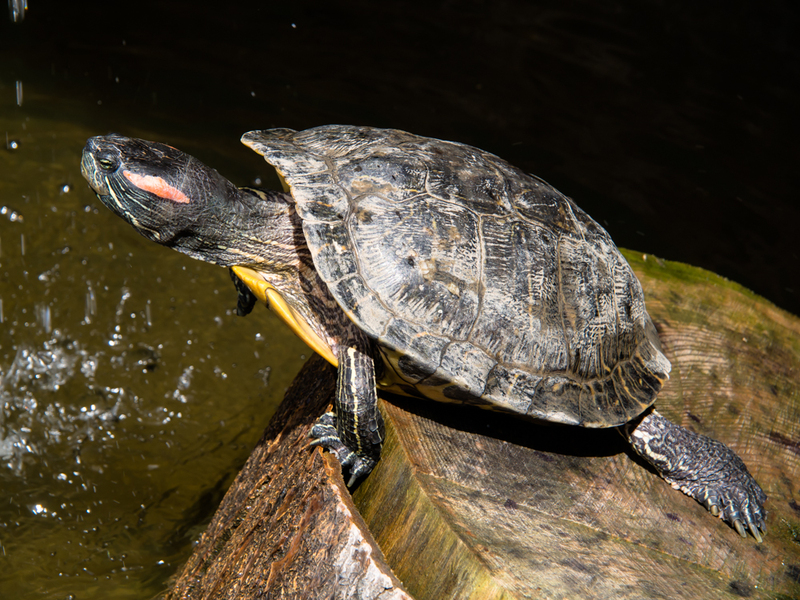 We stopped for lunch in Rocky Ford and spotted this red-eared turtle at the local Mexican restaurant. Our path over the Rocky Mountains was scenic, if a bit slow. Thor's forte is dirt, not asphalt and steep grades at high altitude require lower gears. We generally try to stay off the interstate when possible, but we had a deadline to meet and it was the most direct and quickest route. It was good to see Becky and Peter as it had been several years since the last time we saw them. 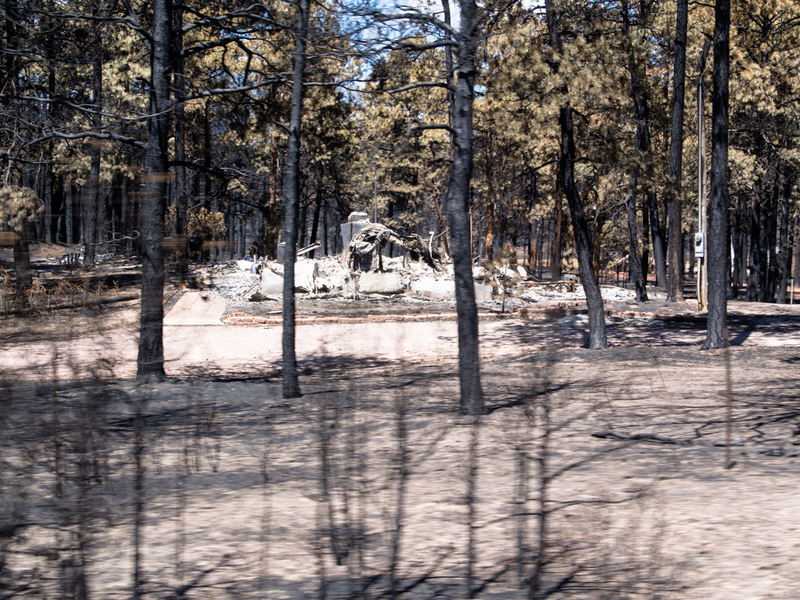 It was heart-wrenching to see the remains of so many homes in the Black Forest area. My heart goes out to them. The objective of our visit to La Junta is to do some maintenance actions on Thor. We have an extensive list of tasks and will start on them tomorrow.